LAHORE: The Lahore High Court (LHC) on Tuesday allowed a Pakistan Tehreek-e-Insaf (PTI) candidate to contest the July 25 polls days after he was disqualified from participating in the election for using pictures of Chief Justice of Pakistan (CJP) Mian Saqib Nisar and Army chief general Qamar Javed Bajwa to promote his campaign. 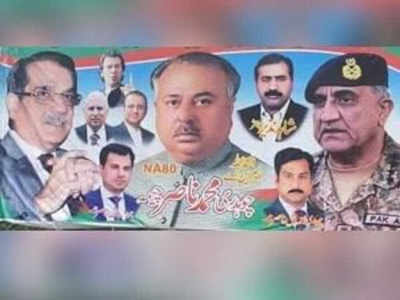 Nasir Cheema, a candidate from Gujranwala’s PP-53 constituency, had violated the electoral code of conduct by using photos of the two senior officials on his election posters. Cheema through his lawyer had challenged the Election Commission of Pakis­tan’s (ECP) decision of his disqualification in the high court. In his petition, Cheema argued that the ECP declared him ineligible to contest on the basis of posters that were put up on April 18, 2018, while the code of conduct had been issued on June 14, and the election schedule was published on May 31. Cheema’s counsel complained that the person who had filed the complaint against his client failed to personally appear before the ECP. “The complainant also doesn’t belong to the PTI candidate’s constituency but is a resident of Karachi,” he emphasised. He further requested the LHC to disclose the reason why the commission had not revealed the specific law under which the candidate was disqualified, calling for Cheema’s reinstatement as a candidate. The two-member LHC bench comprising Justice Aminuddin Khan and Justice Sajid Mehmood Sethi after hearing ECP legal adviser Imran Arif Ranjha’s counter argument ruled that Cheema was eligible to contest in the upcoming elections. Earlier in July, Chief Election Commissioner (CEC) Sardar Mohammad Raza Khan had laid stress on the usage of the pictures of the two heads of institutions, terming the timeline of the action irrelevant. “Are they related to you? What is the army chief’s and CJP’s link to the elections? On what basis did you put up their pictures?” the CEC had asked the PTI candidate, adding that the images should not have been put up at all.